Essential oils are highly concentrated oils that are extracted from plants and contain the essence of the plant aroma. Oil extracts can be obtained from flowers, leaves, roots, peel, seeds, and even wood and bark. Many essential oils can be used in aromatherapy preparations for their medicinal and therapeutic benefits. Having the best essential oils in your home allows you to create many practical home remedies. Essential oils are also very versatile to use, and just having a few in the house can help to address a number of health concerns. Sometimes a combination of the best essential oils can make using them even more effective. You can use essential oils to help relax, ease pain, improve your skin health, treat acne, reduce anxiety, clear sinuses and purify the air. In this article, you will find out the must-have essential oils to always keep in your cupboard. You will also learn how to use essential oils in home remedies to help you feel great. 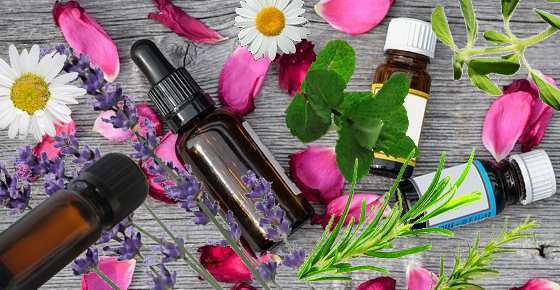 At the end of the article, you will learn about the precautions that you have to take when using essential oils at home. What Are Essential Oils and What Are They Used For? Essential oils (sometimes called EOs) are liquid extracts derived from plant sources. Popular plants from which natural oils are extracted include lavender, lemons, tea tree, rosemary, oregano, and chamomile. The extracted oils are also highly concentrated compounds and must be used very sparingly. In fact, there may be up to 200 constituents in various essential oils. Natural essential oils have many health benefits because they contain bioactive chemicals. Let’s look in more detail at the best essential oils to have at home and why they are good to have on hand. Lavender essential oil is one of the most versatile natural oils to always have at home. Lavender EO has a very fragrant scent that is known to help you sleep better. It is very easy to make your own lavender ointment to help improve your skin condition and relax your frayed nerves. You can mix 4 drops of lavender oil with a tablespoon of sweet almond oil or other carrier oil. Massage a little of the lavender oil blend to help improve your skin’s appearance. Lavender is also one of the top essential oils to relieve anxiety. All you need to do for stress relief is put a few drops in your diffuser. Just inhale deeply the soothing aromas of lavender to help ease the stress. One of the benefits of lavender oil for your skin is that you can put a drop or two directly on your skin as a spot treatment. For example, if you have a large pimple, you can dab a drop of lavender oil on the inflamed bump twice a day to help get rid of the spot quicker. Learn more about the many health benefits of lavender essential oil and other ways you can use this most useful essential oil. The anti-inflammatory and analgesic properties of lavender oil also makes it one of the best essential oils to relieve pain and inflammation. Tea tree oil is definitely one of the best essential oils to have at home because of its antimicrobial benefits. Because tea tree oil helps to kill off fungal infections and reduce itching, you can add tea tree oil to your shampoo bottle to resolve the problem of flaky skin on your scalp. (7) Use 10 drops of the essential oil for every 1 oz. (30 ml) shampoo. Tea tree oil homemade ointments are also good for eczema and helping to reduce skin inflammation. (9) Add 3-4 drops of tea tree oil to a tablespoon of coconut oil and apply a little amount to your skin twice a day to treat eczema, psoriasis, or acne. Find out more about the amazing benefits and uses of tea tree oil. One essential oil to always have on hand is peppermint oil because it not only smells great but helps to relieve pain. To help get rid of a headache or migraine fast, mix 2 drops of peppermint oil with 1 tablespoon of carrier oil. Gently massage onto your temples and behind your head to help your headache disappear quickly. You may also be surprised to learn that peppermint oil is among the best essential oils for muscle pain relief. Learn about more reasons to add peppermint oil to your best oils for good health. Lemon essential oil is in the top list as one of the best smelling essential oils for your home that also has medicinal properties. For example, you can easily make your own skin toner by adding 10 drops of lemon oil, 5 drops of tea tree oil, and 1 tablespoon of witch hazel to a cup of rose water. Use a cotton pad to cleanse your skin in the evening and avoid eye contact. Find out about more ways to use lemon essential oil that smells so good and fresh. One of the top essential oils for healing to have at home is rosemary essential oil. You can help combat the problem of hair loss by adding rosemary essential oil to your shampoo. Use 10-12 drops for every 1 oz. (30 ml) of shampoo. Or, you can mix 4 drops of rosemary oil with a tablespoon of carrier oil and massage into your scalp to help improve hair growth. To help deal with stress better, put a few drops of rosemary on a tissue and inhale deeply to help calm your nerves. Learn about more of the many uses for rosemary oil in aromatherapy, including, how to help hair grow faster. Eucalyptus oil is one of the best essential oils if you have blocked sinuses or chest congestion. To use eucalyptus oil for pain relief and clear chest congestion, mix 3 drops of eucalyptus oil with a tablespoon of carrier oil such as sweet almond oil. Massage onto your chest or area where you have pain 2-3 times a day. Or, to clear blocked sinuses with eucalyptus oil, put a few drops in a bowl of hot water. Put your head over the bowl, cover it with a towel and inhale the therapeutic vapors for 10 minutes. Find out about some other top uses of eucalyptus essential oil that include getting rid of dandruff, easing arthritic pain, and treating migraines. Another of the top Mediterranean essential oils that you should have is oregano essential oil. To use oregano EO for treating topical infections, mix 3 drops with a tablespoon of carrier oil. Apply 4 times a day to the infected area to help treat the infection naturally. Learn about more reasons why oregano essential oil is a must-have essential oil for treating skin and respiratory infections and many other health conditions. Chamomile essential oil is one of the top essential oils for calming your nerves and soothing pain. Studies have shown that chamomile oil has a therapeutic effect when inhaled or applied topically. Learn more about how to use chamomile essential oil to treat insomnia and get a better night’s sleep. The soothing effect of chamomile aromas can also help to address some symptoms of asthma. Sandalwood is one of the best smelling essential oils that has healing properties and is good for anxiety. Find out more about why sandalwood in on the list of the best essential oils to always have at home. Clove is another essential oil that smells good and has many therapeutic uses to help improve your health. Clove essential oil is good for you because it has antimicrobial and antioxidant properties. One of the reasons to always keep some clove essential oil handy is that it can help treat toothache and other dental problems. To get rid of a toothache, you can put a few drops of clove oil on a cotton ball and hold it against your sore gum. Find out more about how to use clove oil in aromatherapy to relieve asthma, reduce painful inflammation, clear sinuses, and treat shingles naturally. Lemongrass essential oil is a very fresh-smelling aromatic oil that has many uses in home remedies. You can also use lemongrass as a mouthwash by putting 2 drops of the EO in a glass of water to swish around your mouth. The pleasant aromas of lemongrass can also give your rooms a fresh smell when you use the essential oil in your diffuser. Find out more about using lemongrass for its many practical and medicinal purposes at home. Clary sage is a very useful essential oil that is always good to have at home for use in natural remedies. Keeping the top essential oils at home means that you always have ingredients to make effective home remedies. Essential oils can be used to calm nerves, relieve pain, get rid of respiratory viral infections, and unblock stuffy sinuses. However, it is good to remember that essential oils are highly concentrated liquids that are very powerful. This means that you should never put essential oils directly on your skin. The best way to use essential oils for your skin is to combine 3-4 drops with every tablespoon of carrier oil. The only exception to putting undiluted essential oils on your skin is lavender oil and tea tree oil that can be used as spot treatment. However for larger skin areas you need to dilute them with a carrier oil. Even though essential oils are completely natural, you should always check for allergic reactions. To prevent adverse reactions, always do a spot check on your skin.